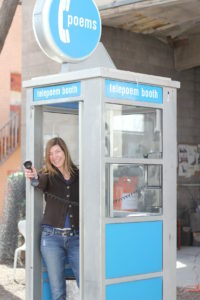 A Telepoem Booth invites the public to enter a 1970s phone booth, locate a verse in the Telepoem Book, and dial-a-poem on the rotary phone. This interactive art piece offers poetry from both regional poets and popular favorites used with copyright permissions. The Telepoem Booth project repurposes and re-enchants decommissioned (and disappearing) telephone booths to give back to communities in multi-sensory ways. Telepoem Booths are visual, haptic and aural; most importantly, they are engaging art pieces that require the audience’s participation. Telepoem Booths deliver an impactful emotional insight to each listener. Hearing poetry read can be cathartic, providing a multi-sensory way for the public to access poetry. The booths create small, unexpected moments of beauty and insight in an otherwise busy digital world, as well as remind people of (or introduce people to) an analog, more kinesthetic interface with technology, nostalgia, and sense of place. The first Telepoem Booth premiered in Mesa, AZ at the spark! 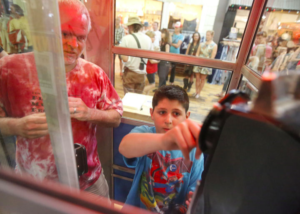 Festival of Creativity at the Mesa Arts Center, March 18-19, 2016. One is currently located in Flagstaff, AZ. Another is being placed in State College, PA (home of Penn State) in Spring, 2017. The booth itself is a self-contained unit; the old school “pulse technology” of dialing a rotary phone is translated through a cutting edge computer to access the mp3 files of poetry. For future booths, there will be a wi-fi enabled downloading system, which will allow new poetry updates from a central location for all Telepoem Booths in the nation, providing convenience and ease for the clients and a constantly fresh supply of new poetry. The poem listings will be located on this website and accessible through a QR code and in a physical directory. The Telepoem Book is compiled and printed once a year on durable paper and a spiral binding. It is placed inside the booth on a custom-made stand and attached by a metal rod. Each poem is assigned a ten digit Telepoem number; the area code is the poet’s own area code, the prefix digits are the first three letters of the poet’s last name, and the suffix numbers are the first four letters of the poem title. The Telepoem Booth has proven to be a provocative, exciting and intriguing installation art piece for the public. Since its placement July, 2016 at the new location (120 N. Leroux St.) in Flagstaff, listeners have dialed an average of 112 poems every day. These people have stumbled onto poetry that they would otherwise not have heard. Most art and literary projects are unable to engage the public on this level. Please contact me if you are interested in bringing a Telepoem Booth to your area!